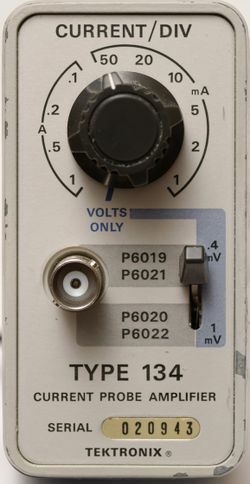 The Tektronix 134 current probe amplifier interfaces a P6019, P6020, P6021 or P6022 current probe to the voltage input of an oscilloscope. It comes with its own power supply, the 015-0058-01. Comparison of P6022 with passive termination @ 10 mA/Div (top trace) vs. P6021+134 (bottom trace). Signal is a sawtooth from a HP3325A @ 5 Vp-p into 50 Ω = 100 mAp-p.